Most people have heard of glaucoma and cataracts, but you rarely read or hear about uveitis. Uveitis, which is pronounced you-vee-eye-tis, is internal inflammation of the eye that can lead to loss of vision or even blindness. The sooner the cause of uveitis is determined and the sooner a person is treated, the better chances of a positive outcome. Uveitis, or inflammation of the uvea, can affect the iris (the colored part of our eyes), the choroid (a thin membrane that contains blood vessels in our eye), and the ciliary body, which is the part of the eye that joins these together. The uvea is extremely important since it contains arteries that transport blood to the different parts of our eye that help us to see. The uvea is located between the retina and the sclera, which is the white of the eye. When someone gets uveitis. it is defined by the part of the eye where the inflammation is occurring. In many cases, people get posterior uveitis. As you may have guessed, this affects the back part of the eye. Anterior uveitis is the most common location for this condition. This is uveitis in the middle of the eye. It is also called iritis uveitis. When someone has panuveitis, it means all layers of the uvea are inflamed. As mentioned, uveitis is inflammation in the eye, but how does this happen? Uveitis causes are vast. It could be due to an infection or disease. In many cases, it is an attack from the body’s own immune system. If you experience inflammation, it means the body is responding to tissue damage, germs, or toxins. It leads to swelling, heat, redness, and can destroy tissues when white blood cells rush to the affected part of the body to try to eliminate the offender. In cases where anterior uveitis has been diagnosed, the cause could potentially be an autoimmune disorder, such as rheumatoid arthritis or sarcoidosis. 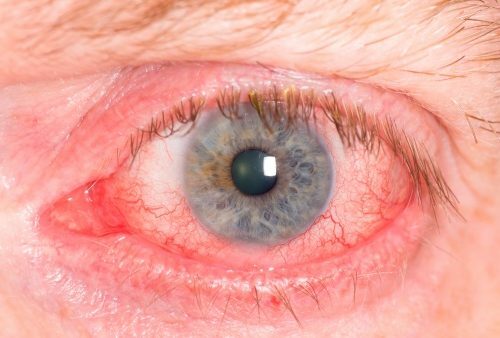 While posterior uveitis can be caused by infections including bacterial, fungal, parasitic, and viral, noninfectious causes are also possible, such as immune issues. Studies show that bruises to the eye, toxins that penetrate the eye, as well as tumors within the eye can cause uveitis. Uveitis symptoms depend on where the inflammation is and what stage the condition has reached. Here is a look at some of the more common symptoms of uveitis. Symptoms can appear suddenly or develop gradually. They can impact one eye or both eyes. If not treated properly, uveitis can lead to complications. People with posterior uveitis are at most risk of developing problems, and so are those who are over the age of 60. It is unfortunate, but sometimes steroids, which are used to treat uveitis, can cause other eye conditions, such as glaucoma and cataracts. Cystoid macular oedema – this is swelling of the retina and can be a complication in people who experience chronic uveitis that affects the back of the eye. When it begins to develop, you may notice a black spot in your central vision. This can progress to loss of vision. Early treatment can help restore vision. Detached retina – the lining at the back of the eye begins to pull away from blood vessels. While rarely caused by uveitis, it can occur after an attack of posterior uveitis that is caused by viruses. Posterior synechiae – this is caused by the iris sticking to the lens of the eye. It is more likely to happen when uveitis is not treated quickly enough. Eyes are really our windows to the world and need to be well taken care of. If you suspect any problems with your eyes, do not ignore them. Uveitis can be serious, so early diagnosis and treatment is important. Uveitis treatment can be in various forms, but medication is the main treatment. In severe cases, surgery is performed. Uveitis treatment guidelines include steroid medications or, as many people call them, corticosteroids. A medication called prednisolone is often used. It can disrupt the chemicals that cause inflammation. Corticosteroids are available in eye drops, which are usually recommended in cases where a person is suffering from anterior uveitis that is not caused by an infection. It also comes in the form of injections. If the middle or back of the eye is affected and eye drops don’t seem to be improving the situation, corticosteroid injections can be given. A local anesthetic eye drop is used to numb the eye, so there is no pain during the injection procedure. Some people take oral corticosteroids, which are the strongest form of corticosteroids. They are often suitable for posterior uveitis treatment. The length of treatment largely depends on how well a person responds to the first treatment and whether the patient has any underlying medical conditions, including autoimmune disorders. In most cases, the doctor will start with the lowest dosage possible to minimize any side effects. When it comes to approaching uveitis treatment naturally, eye specialists contend that there is no magic substitute for conventional treatments. However, some studies suggest that vitamin D and vitamin E are good supplemental treatments, especially for those who experience anterior uveitis. Recent research also suggests that oxidative stress may play a role in causing uveitis, so maintaining a diet that is high in antioxidants is good for eye health. Purple and red grapes, blueberries, red berries, nuts, dark green vegetables, sweet potatoes, and green tea are all examples of antioxidants that fight inflammation. Lastly, some ophthalmologists steer their patients with mild cases of uveitis towards natural, preservative-free eye drops. Uveitis can be frightening, especially when it comes on suddenly and progresses quickly. With a quick treatment response and the right approach, diminished vision is often restored so that the window to the world remains clear. If you have any issues with your eyes, don’t hesitate – see an eye doctor immediately.